With those famous words unfolds a tale that renews the joy and caring that are Christmas. Whether we read it aloud with our family and friends or open the pages on a chill winter evening to savor the story in solitude, Charles Dickens’ A Christmas Carol is a very special holiday experience. It is the one book that every year will warm our hearts with favorite memories of Ebenezer Scrooge, Tiny Tim, Bob Cratchit, and the Ghosts of Christmas Past, Present, and Future—and will remind us with laughter and tears that the true Christmas spirit comes from giving with love. With a heartwarming account of Dickens’ first reading of the Carol, and a biographical sketch. 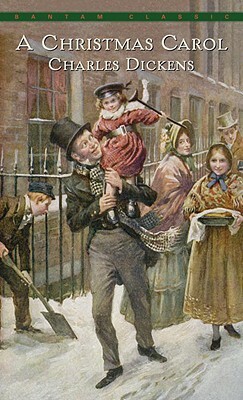 Dickens’s marriage to Catherine Hoggarth produced ten children but ended in separation in 1858. In that year he began a series of exhausting public readings; his health gradually declined. After putting in a full day’s work at his home at Gads Hill, Kent on June 8, 1870, Dickens suffered a stroke, and he died the following day.